Hi, I am interested in your 1927 Ford Other Ford Models (stock #1732-TPA) listed on Autotrader for $69,995. I'd like to get more information about this vehicle and confirm its availability. 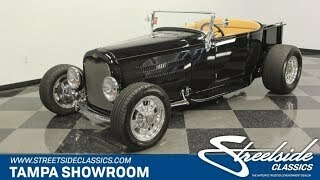 This is an award-winning full custom build of an all-steel 1927 Ford Roadster Pickup. So while you already know this low-mileage head-turner checks all the right boxes, dont forget to dig into the details like the amazing flathead V8, slick paint, leather interior, and much more. This car debuted at the Sacramento Autorama in 2017, and it has been collecting trophies ever since (one of the 1st place awards even comes with the sale.) And you know what kind of quality it takes to impress a California crowd with a custom build. They started with a quality Shadow Rods all-steel pickup body. They subtly add size for extra comfort, and the longer profile also has the side benefit of giving this a stretched/sporty profile. And speaking of the profile, the black paint really loves to dance across this all-steel body. And with less than 300 miles on the whole build, you have a fresh luster and the kind of panel accuracy that comes from someone taking the time to really get this right. Its a level of quality you get on a six-figure build, but you dont have to pay nearly that much to take this home. In fact, take some time to really see the thoughtfulness of the whole build. Brightwork is used only in the right places to accent terrific pieces like the front axle, windshield, and bed rails. Plus, detail lovers will pick up on the cool wheels that take the design Halibrand offered on the Studebaker Avanti, and updates it for a wider stance and adds a mirror-like shine. Even more eye-catching details include a dark black removable soft top and real oak in the truck bed. Plus, theres a bold tan pinstripe that surrounds the cab and highlights the Ford script on both front and rear. Inside is a comfortable and coordinated total package. The tan pinstripe on the outside is a nice preview of the full tan leather interior. The larger cab gives you extra room, and the Wise Guy bucket seats with center console deliver the most comfortable street machine you know. This a highly detailed execution, and you see it everywhere from the how the carpet piping matches the seats, to the cool saddle bags built into the door panels. More than just look award-worthy, this is built to be a drivers machine. That means a grippy black and chrome steering wheel, Ididit chrome steering column, Lokar shifter, and a dash full of crisp Classic Instruments gauges. The engine bay can win you awards all on its own. Its part of over $7,000 invested in building an iconic Ford 59A flathead V8. The bold red block and shine coming off all the polished components ensures youre going to show this one off with pride. Even the details are great, including the Offenhauser valve covers. More than just look terrific, this V8 was built to run. It has been fortified and enhanced with a Holley four-barrel carburetor, Offenhauser intake, .125 bore, Mercury 4 stroke, and headers feeding the growling dual exhaust. You even have great supporting components on this fresh motor, like the Walker aluminum radiator with electric fan. As you look at the undercarriage photos, you see more great investments like the Super Bell polished drop axle, a fully chromed Winters Performance quick change rear end, and adjustable coilovers. And while this build has hardly any miles on it, we know you wont be able to resist adding to the odometer, especially with nice driving features like the three-speed automatic transmission and Wilwood four-wheel disc brakes. There are receipts detailing this fresh build, but you already know this is thousands $$$$$ less than what it would take to do it yourself. So dont miss out on this slick, fresh, and memorable machine. Call today!! !